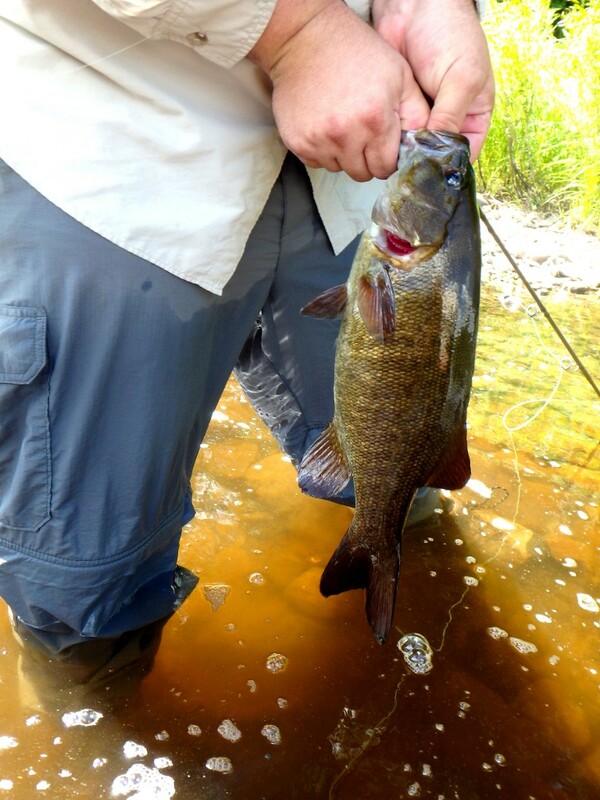 I definitely caught Smallmouth fever this Summer, and as far as I can tell, I’m stricken for life. 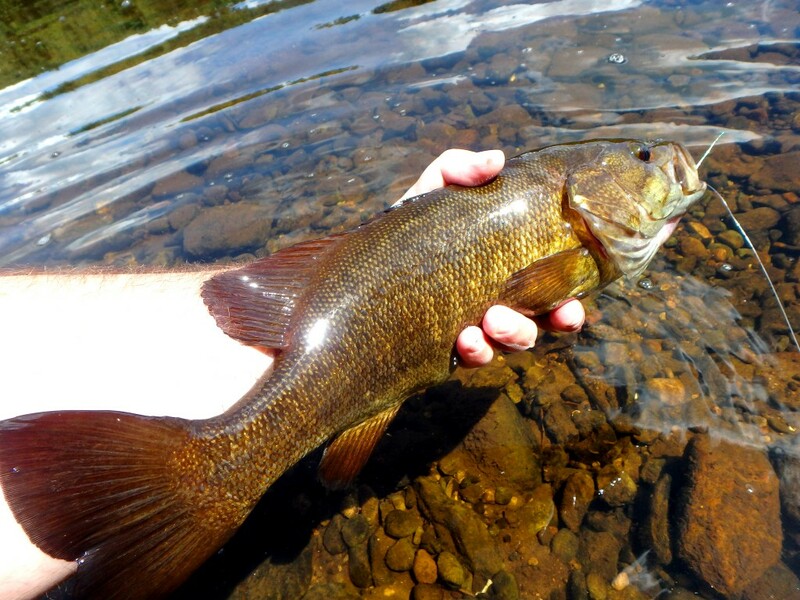 As hard as it is to walk away from trout rising to hoppers and terrestrials in the Driftless area during the summer, I’ve been growing increasingly fond of the Smallmouth waters in the North Woods where I spent Summer’s with my Grandparent’s. 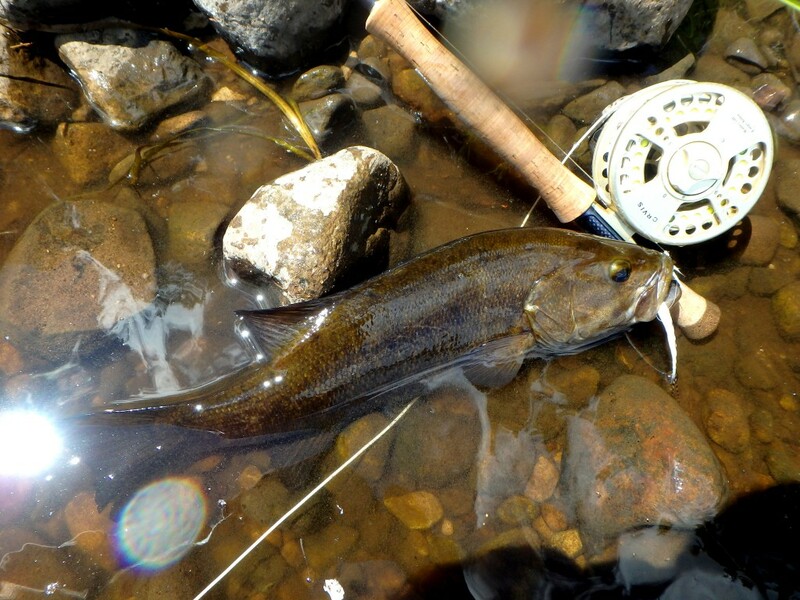 Not only do hot summer days limit your fishing time for trout, but it’s also the most difficult time of year to navigate all the growth and I usually get over heated pretty quick in between holes. Ben with a fish on!!! Suffice to say, once I was floating down one of the North Wood’s iron stained rocky bottom rivers in my swim trunks and paddle shoes, wading in soothing knee deep water with my rod doubled over with alarming regularity…I thought to myself, “What could possibly be better than this?” I’m sure Steelhead fever is right around the corner, but for now…long live the Bronzebacks!!! I may never think of fishing for trout in the Midwest again during the Summer months. 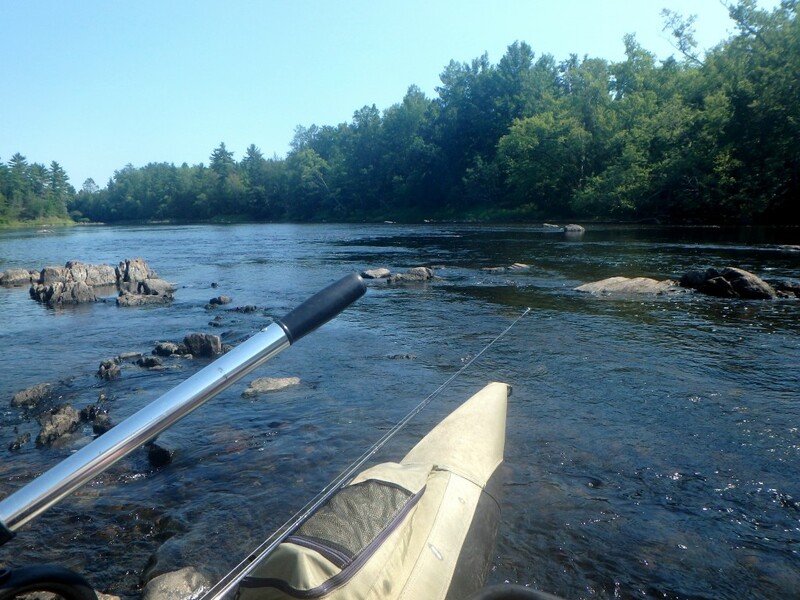 A few weeks ago I floated a section of river with a new fishing buddy Ben that I met through Anthony. He’s a member of the Illinois Smallmouth Alliance (ISA) so I didn’t think it would be hard for me to make an iron clad case as to why we would drive 5 hours for Smallies. After a little of his own homework and consulting other ISA members who were familiar with the water I was building up, he was sold. Day 1 was a lower river stretch I had fished twice before with mixed results. There’s definitely some paddle water that’s not very fishy but the fishy water was red hot!!! 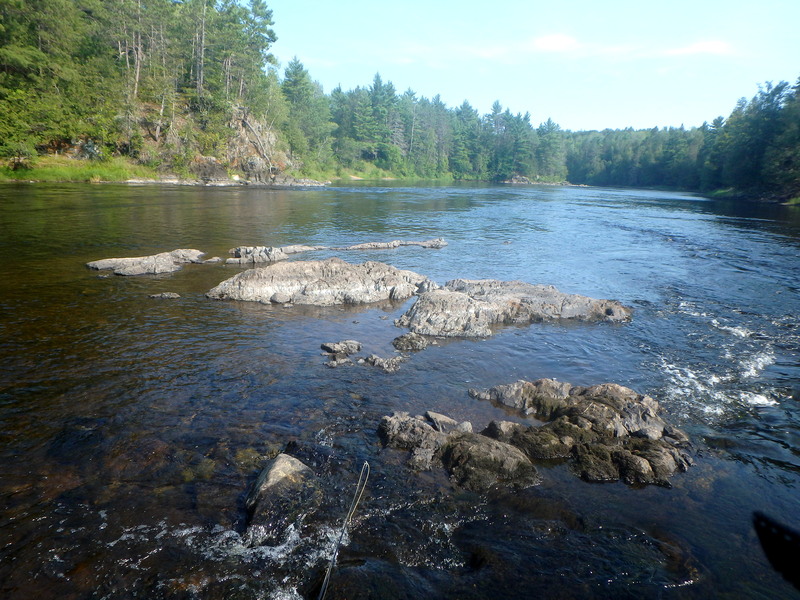 All of the rocky sections, weed edges and narrow deep channels brought fish. And when we weren’t catching fish, we were seeing fish. Together, Ben and I landed A LOT of fish and at one point had twin hook-ups. 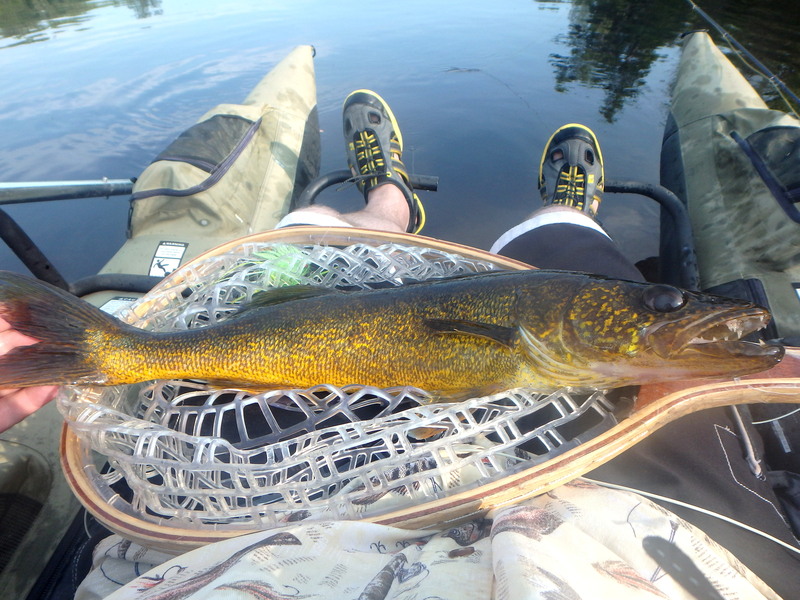 After the twin hook-up my next cast was destroyed by a Smallie over 20″. I was pretty much done with my retrieve when I saw the fish come barreling out of the rocky run. I could see my fly’s life flash in front of it’s artificial eyes. 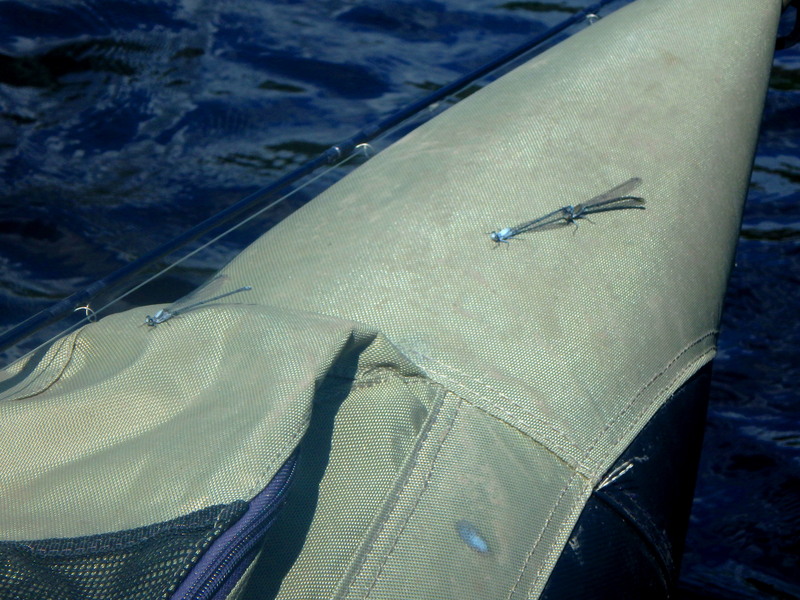 The fish savaged my fly, made me loose my cool and broke off seconds into what felt like a Steelhead on the swing grab. 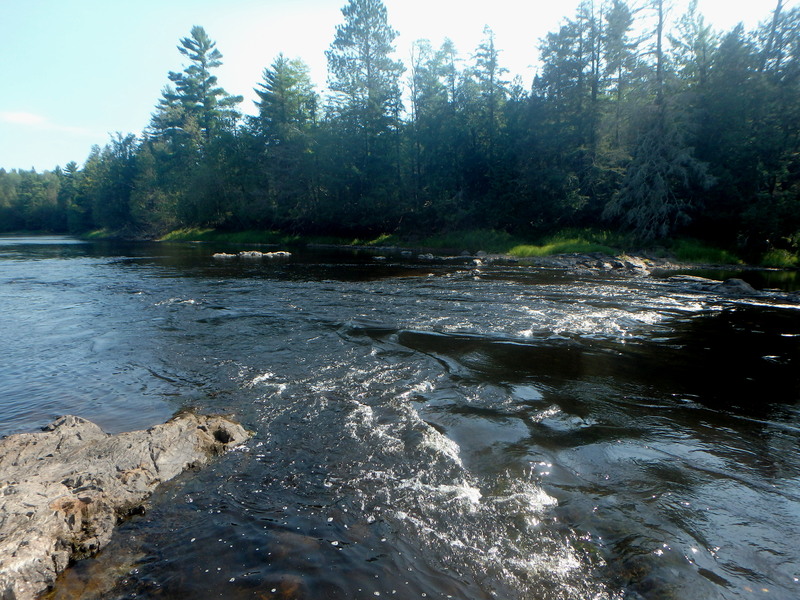 These North Woods Smallies have native roots in these rivers and the heart they fight with pound for pound reflects this. Day 2 was a bust because t-storms were everywhere in the morning. 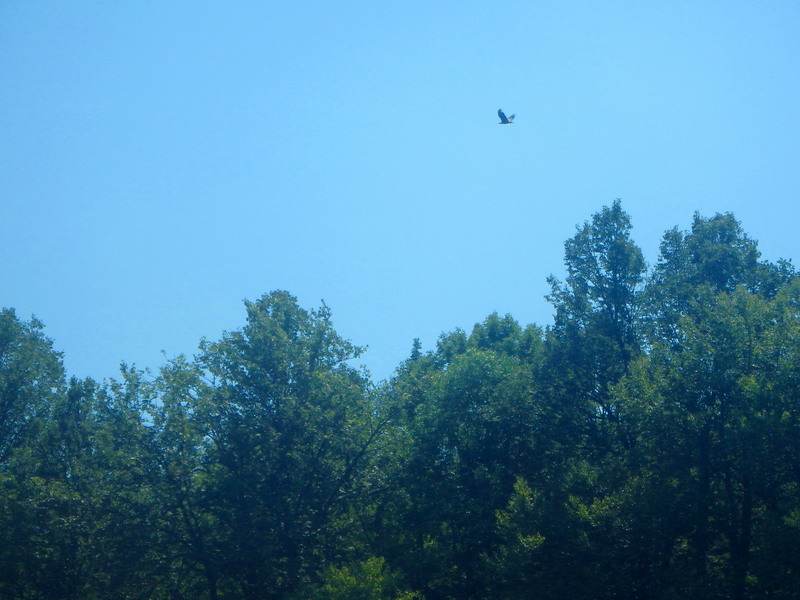 We were supposed to float a more scenic upper river stretch about 45 river miles upstream from where we floated Day 1. All week my curiosity drove me berserk so I made plans to return two weeks later by myself and do a bike shuttle. 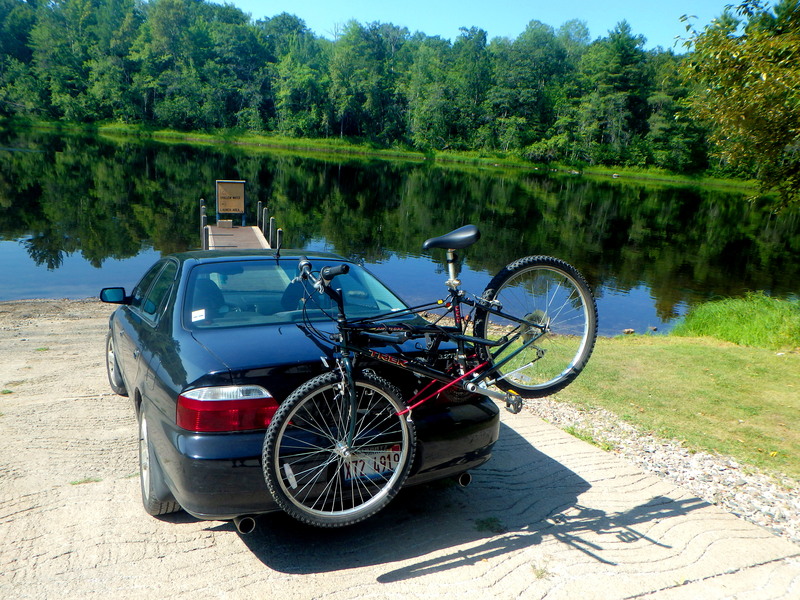 For the poor fisherman like myself that also doesn’t have a lot of space, an inflatable pontoon and cheap bike rack really opens up a lot of possibilities. It took me awhile to justify making a 10 hour, two day trip for Smallmouth but the solitude, excellent fishing, and beautiful river made it more than worth it. It just might be the best fishing I’ve ever had. Heck of a trip, man! 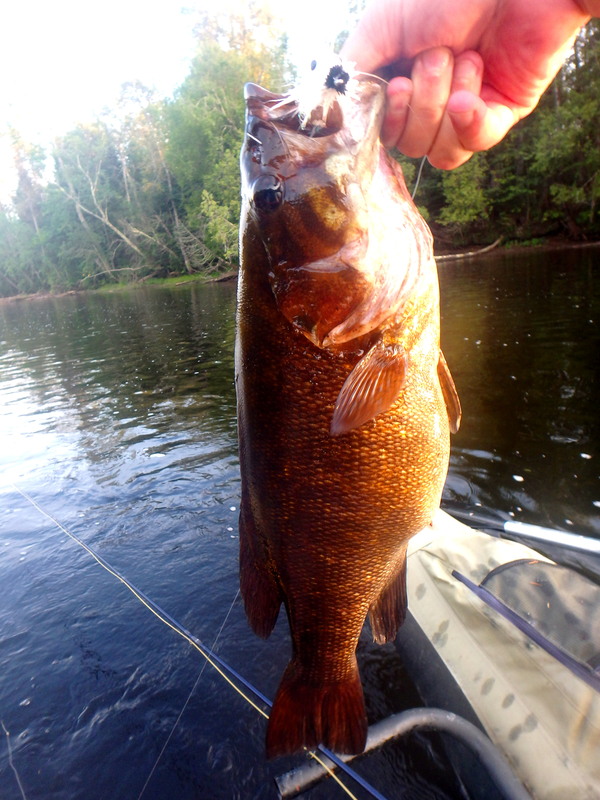 I am a Northwoods smallie fishing fanatic! Great write up and pictures. 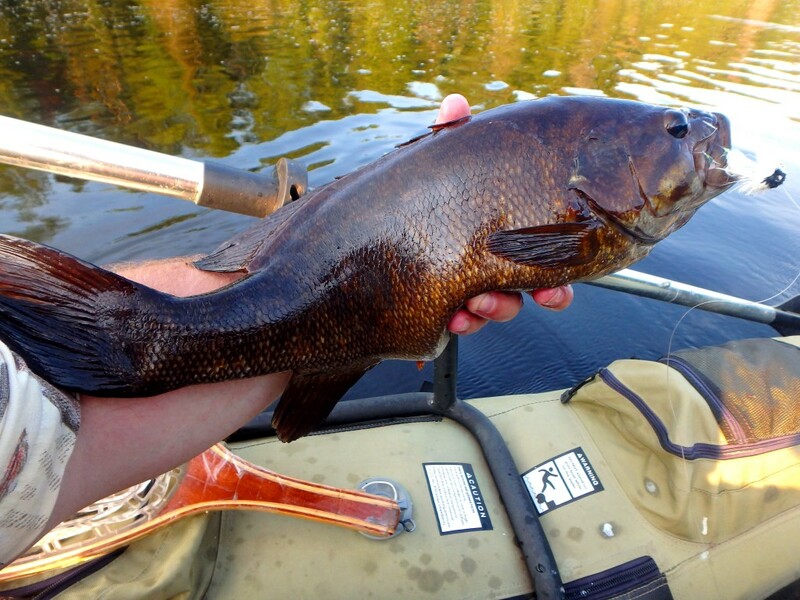 During the months of July and August you really can’t beat the smallie fishing up North. Did you try any top water? 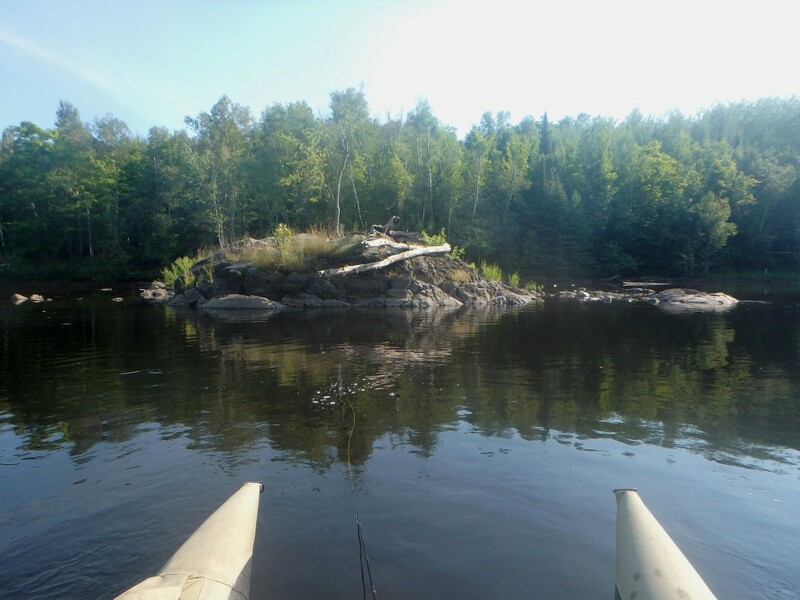 I was actually up there this past weekend (8/14-8/17) on a solo exploring fishing trip. I had to take a double look at one of my pictures, because that boat launch looked all too familiar, but it wasn’t the same one. We might have been in the same area. Thanks man. Top water was very successful with Dahlberg Diver or Zoo Cougar style flies. Early morning 8/15 they were feeding on flying ants. Never would have believed they’d key in on something so small if I didn’t see it with my own eyes. Apparently it happens for about a week once every August according to the Tight Lines guys. Might even try the Fall bite this year once temps drop and throw some serious articulated meat for pig Smallies with a chance of Muskie or Pike. Would love to be on that water when the colors start popping.